Heat a medium saucepan to medium-high heat. Whisk in all BBQ sauce ingredients. Allow to simmer 20-30 minutes, until thickened. Remove from heat. Taste and adjust seasoning, if necessary. Preheat oven to 400 degrees. Grease a baking sheet fitted with a wire rack. In a medium mixing bowl, toss cubes of chicken breast with salt and pepper. Then toss with flour until coated. In a small mixing bowl, whisk together eggs and milk. In a separate small mixing bowl, add Panko breadcrumbs. Dip flour coated chicken cubes into egg/milk mixture, then Panko. Line on wire rack and coat wings with cooking spray. Bake 8-10 minutes, until internal temperature of chicken reaches 165 degrees, and exterior is browned and crispy. Remove from oven and allow to slightly cool. 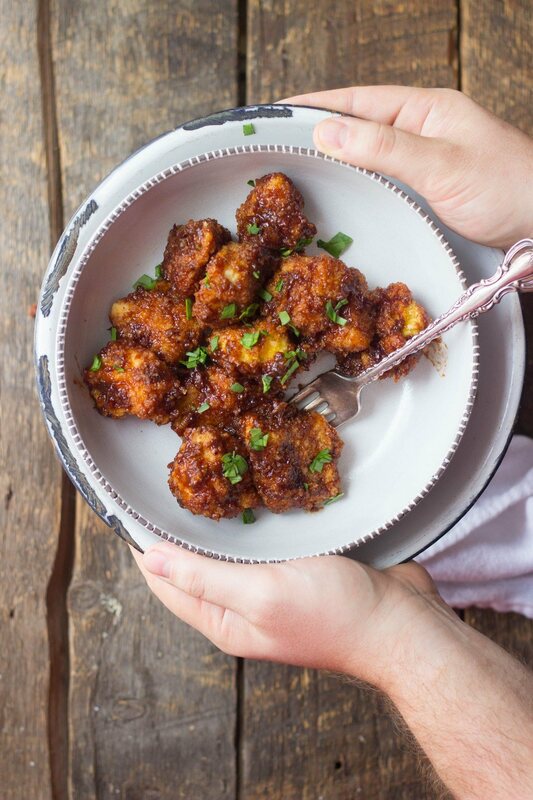 Toss chicken wings in BBQ sauce and serve with ranch or bleu cheese dressing.